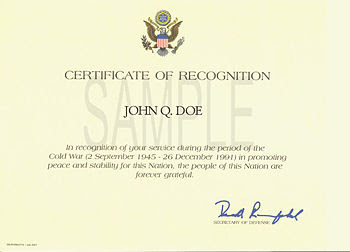 You will need proof of your service, such as a DD Form 214 (Record of Military Service). -Prepare, date, and sign a letter, requesting the award of the Cold War Recognition Certificate. You can also fill out an official request form at the Army's Cold War Recognition Certificate Website. -You may also FAX the letter and proof to: 1-800-723-9262. Additional tips: Your letter must contain the phrase "I certify that my service was honorable and faithful" or it will be rejected. Do not send the original of your proof of service. Send a copy. Original documentation will not be returned. There is a large demand for this program; and the current backlog time is about 6 months.